It isn’t true that in 1843, when Wakulla County was created out of Leon County, the dividing line was drawn where the red clay ended and the sand of the coastal plain began. The sand actually starts just south of Tallahassee, Florida before you're out of Leon County. 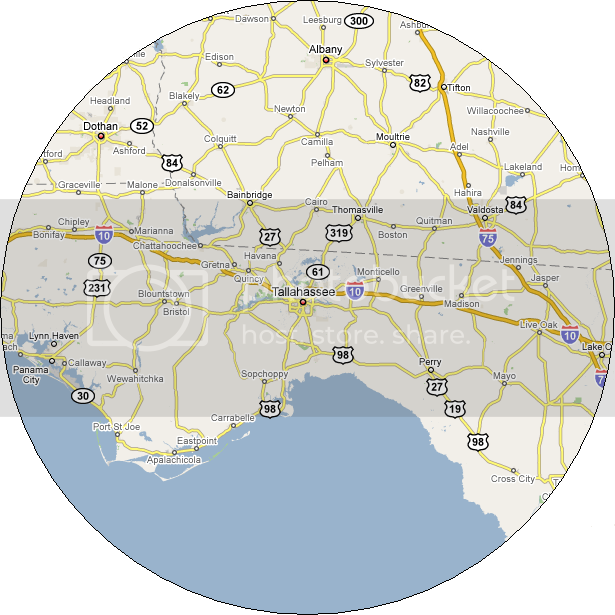 It continues south into Wakulla, and from there all the way to the Gulf of Mexico. So it is true that once you cross the county line into Wakulla, you’ll find nothing but sand, punctuated with the occasional limestone outcropping. That includes Florida's Wakulla Springs State Park, and it also includes the course of the sixth annual Paul Hoover Memorial 5K Freedom Run inside the park. Geology will tell you why all that sand is there. Ryan Truchelut relied on another science to explain the state of the sand at the race. Rather than lecture about the sand on Saturday morning, 30 June 2018, Truchelut raced on it, winning the Freedom 5K in 18:21. Amy Hines was the first woman in the race, placing third overall in 19:10. In spite of the frequent rains that Truchelut mentioned, it was a sunny morning when the Freedom 5K started just after 8:00 AM. Myles Gibson led the early charge off of the park’s paved drives and onto the trail headed to Cherokee Sink, the site of the mid-race turn-around. A crop inspector, Gibson had traveled all the way from his home in Donalsonville, Georgia for the race. That was where Truchelut took over. “I passed Myles at about a third of a mile,” said Truchelut. “After that I was running alone, just me and the sand. I tried to work on my form. It was for Truchelut while he cruised home unchallenged in a winning 18:21. Brad Busboom picked off the fading Gibson to take second in 18:40. Mason McCord, a junior on the Wakulla High cross-country team, also overtook Gibson, placing third in the men's standings and fourth overall in 19:44. A few steps behind McCord at the finish line, Gibson was the first master runner in the race, taking fifth overall in 19:48. With the eye of a cross-country runner, Amy Hines noticed where the good footing was on the course. Perhaps Hines had a gift for finding those shady spots, because her 19:10 was the fastest time ever posted by a woman at the Freedom Run. The previous women’s course record was 19:51, set in the 2015 race by Katie Sherron. No other women have broken 20:00 at the Freedom Run. After running together early in the race, Kat Sack took the second women's spot over Alyssa Terry, 21:55 to 22:04. Sack and Terry were seventeenth and eighteenth overall. Summer Williams, a senior on the Florida High cross-country team, was the fourth woman and nineteenth overall in 22:16. Angela Dempsey was the first woman master and sixth female finisher, 25th overall in 23:00. Hines' 19:10 wasn't the only record that morning. There were also a record number of finishers in the race, 213. It was the first time that more than 200 athletes had finished the Freedom Run. The Freedom Run 5K was established in 2013 as a fundraiser for Coach Paul Hoover's cross-country team at Wakulla High. After Hoover's tragic death in 2017, the Wakulla High Cross-Country Boosters continued the race as a memorial to Coach Hoover. Gulf Winds Track Club chip-timed the 2018 Paul Hoover Memorial 5K Freedom Run. The second annual Saint Peter's Anglican Cathedral 10K was held on 16 June 2018, and June is not a month when you'd expect great running weather in Tallahassee, Florida. The course for the 10K isn't what you'd expect to be fast, either, with significant portions of the race off pavement. Taking that into consideration, you wouldn't expect performances from the Saint Peter's 10K to show up on the list of Tallahassee's top road times for the year. So much for expectations. Athletes at the Saint Peter's 10K did make the year's top 25 list for that distance, starting with Poncherella Leonard. A Bainbridge High alum currently running for the University of Tennessee-Martin, Leonard won the race in 35:52, which currently ranks fifth in 2018. On the women's side, Amy Hines ran 40:11 at Saint Peter's, which is to date the fourth fastest road time by a woman in Tallahassee during 2018. Behind Hines, Elisha Boggs ran 43:42, which is Tallahassee's fastest time by a woman master this year. Boggs' time is eighth on the women's list. The Saint Peter's 10K didn't shake up the very top of the lists, though. Christopher Haynes still has Tallahassee's fastest road 10K of the year with the 32:31 he ran at the Springtime 10K on 7 April 2018. Katie Sherron continues to lead the women with the 38:57 she ran in the same race. Includes performances from the Springtime 10K (7 Apr 2018) and Saint Peters Anglican Church 10K (16 Jun 2018). Wakulla County Cross Country Boosters' 6th annual Paul Hoover Freedom 5K and one-mile fun run. 8:00 AM ET 5K / 8:45 AM ET one mile. Wakulla Springs State Park, 550 Wakulla Park Drive, Wakulla Springs, Florida 32327. 2017 story. 2016 story. 2015 story. 2014 story. 2013 story. Event page on Facebook. Entry form and flyer. Online registration at EventBrite.com. 36th annual Firecracker 5K and one-mile Sparkler Run. 7:30 AM ET one mile / 8:00 AM ET 5K. Cascades Park, 1001 South Gadsden Street, Tallahassee, Florida 32301. 2017 story. 2016 story. 2015 story. 2014 story. 2013 story. 2012 story. 2011 story. 2010 story. USATF certified 5K course FL17036TY. 10th annual Valdosta Independence Day 5K. 7:30 AM ET. American Legion Post 13, 1301 Williams Street, Valdosta, Georgia 31601. 2017 story. 2016 story. 2015 story. 2013 story. 2012 story. 2011 story. 2010 story. Online registration at RunSignUp.com. Florida Track Club's 40th annual Melon Run Three Mile. 8:00 AM ET. Albert "Ray" Massey Westside Park, 1001 NW 34th Street, Gainesville, Florida 32605. 2017 story. 2016 story. 2015 story. USATF certified three-mile course FL17088TY. 2018 event page on Facebook. Online registration at RunSignUp.com. Gulf Winds Track Club Summer Trail Series #2, Elinor Klapp-Phipps Park (4 miles). 7:30 AM ET. Phipps Park, Miller Landing Road, Tallahassee, Florida 32312. 2017 story. 2016 story. 2015 story. 2014 story. 2013 story. Series web page. Series page on Facebook. Online registration at EventBrite.com. Jim and Kristin Halley GulfWindsTrails@gmail.com. Valdosta All-Comers Track Meet #5. 6:30 PM ET. Rolling schedule: 1600 meter, 200m, 800m, 50m (youth 10 and under), 100m, 400m, 3200m, 4 x 400m relay. Valwood School, 4380 Old US Hwy 41 North, Hahira, Georgia 31632. A Course/Line, acourseline@earthlink.net or 229-630-1455. 10th annual Barnes HealthCare 5K. 7:30 AM ET. Barnes Drug Store Downtown, 200 South Patterson Street Valdosta, Georgia 31601. 2017 story. 2016 story. 2015 story. 2014 story. 2013 story. 2012 story. 2011 story. 2010 story. 2018 event page on Facebook. Online registration at RunSignUp.com. Gulf Winds Track Club Summer Trail Series #3, Maclay Gardens State Park (5 miles). 7:30 AM ET. Maclay Gardens State Park, 3540 Thomasville Road, Tallahassee, Florida 32309. 2017 story. 2016 story. 2015 story. 2014 story. 2013 story. Series web page. Series page on Facebook. Online registration at EventBrite.com. Jim and Kristin Halley GulfWindsTrails@gmail.com. 2nd annual Charlie Strong 5K. 8:00 AM ET. Pearson Recreation Department, 193 Relihan Street, Pearson , Georgia 31642. Event page on Facebook. Gulf Winds Track Club Summer Trail Series #4, Tom Brown Park (4-1/2 miles). 7:30 AM ET. Tom Brown Park, 501 Easterwood Drive, Tallahassee, Florida 32311. 2017 story. 2016 story. 2015 story. 2014 story. 2013 story. Series web page. Series page on Facebook. Online registration at EventBrite.com. Jim and Kristin Halley GulfWindsTrails@gmail.com. 3rd annual Back The Blue 5K and one-mile Doughnut Dash. 8:00 AM ET 5K / 8:45 AM ET one mile. Wild Side Running, 2341 Lake Park Drive, Albany, Georgia 31707. 2017 story. 2016 story. Event page on Facebook. Online registration at active.com. 30th annual Bushwacker 5K. 7:30 AM CT. Gulf Breeze Recreation Center, 800 Shoreline Drive, Pensacola, Florida. USATF certified course FL10048EBM. 2017 story. 2016 story. 2015 story. Event web page. Event page on Facebook. Entry form and flyer. 13th annual Blaze The Day VSU Community 5K and one-mile fun run. 7:30 AM ET 5K / 8:30 AM ET one mile. Valdosta Early College Academy, 1605 Azalea Drive, Valdosta, Georgia 31602. 2017 story. 2015 story. 2014 story. 2013 story. 2011 story. 2010 story. USATF-certified 5K course GA18010WC. 2018 event page on Facebook. Entry form and flyer. Online registration at RunSignUp.com. 2nd annual Big Bend Cross-Country Invitational Community 5K. 7:30 AM ET community 5K / 8:15 AM ET high school girls' 5K / 9:00 AM ET high school boys' 5K / 9:40 AM ET middle school girls' 3K / 10:00 AM ET middle school boys' 3K. Apalachee Regional Park Championship Cross-Country Course, 7550 Apalachee Parkway, Tallahassee, Florida 32311. 2017 story. Event web page. 37th annual Sickle Cell Foundation of the Big Bend 5K and one-mile fun run. 8:10 AM ET one mile / 8:30 AM ET 5K. Jake Gaither Park, 801 Tanner Drive, Tallahassee, FL 32305. 2017 story. 2016 story. 2015 story. 2014 story. 2011 story. 2010 story. USATF certified course #FL18025TY. Event web site. 5th annual Saint Jude Run To End Childhood Cancer 5K. 8:00 AM ET. 3196 Merchants Row Boulevard, Tallahassee, Florida 32311. 2017 story. 2016 story. Event web page. Event page on Facebook. 18th annual Run Like The Devil 5K Trail Race (nee Life Is A Beach 5K). 8:00 AM CT. Westgate Park, 801 Recreation Road, Dothan, AL 36303. 2017 story. 2016 story. 2015 story. 2014 story. 2013 story. 2012 story. 2011 story. 2010 story. Event web page. Entry form. Larry Dykes, drcprez@yahoo.com or 334-792-6021. Harvest Hustle 5K. 8:00 AM ET. Whigham Elementary School, 211 West Broad Avenue, Whigham, Georgia 39887. Online registration at active.com. 12th annual Trot with S.W.A.T. 10K and 5K. 8:00 AM CT. Poplar Head Park, 126 North Saint Andrews Street, Dothan, Alabama 36303. 2017 story. 2013 story. Carol Goguen, cgoguen@graceba.net or 334-794-9029. 8th annual Get-A-Mammy 5K. 8:00 AM ET. Bethany Baptist Church, 5064 Bethany Road, Hahira, Georgia 31632. 2017 story. 2016 story. 2014 story. 2013 story. 2012 story. 2011 story. 11th annual Red Cross Robin Lotane Memorial Hurricane Run 5K and one-mile fun run. 8:00 AM ET one mile / 8:30 AM ET 5K. State Office Satellite Complex at SouthWood, 4079 Esplanade Way, Tallahassee, Florida. 2015 story. 2013 story. 2012 story. 2011 story. 2010 story. 2009 story. Pirates of the High Seas 5K and one-mile fun run. 8:00 AM CT. Frank Brown Park, 16200 Panama City Beach Parkway, Panama City Beach, Florida 32413. Online registration at active.com. The Halloween Half Half Marathon & 5K. 7:30 AM ET. Riverfront Park, 112 North Front Street, Albany, Georgia 31701. Event web site. Event page on Facebook. Tricker Trek 10K, 5K and one-mile fun run. 8:00 AM CT 10K and 5K / One mile immediately afterwards. Conservation Park, Griffin Boulevard, Panama City Beach, Florida 32413. Online registration at active.com. 5th annual Ryno 5K. 8:00 AM ET. Rosalynn Carter Institute For Caregiving, Georgia Southwestern State University, 800 Georgia Southwestern State University Drive, Americus, Georgia 31709. Online registration at active.com. Gulf Winds Track Club's 43rd annual Tallahassee Turkey Trot 15K / 10K / 5K and one-mile fun run. 8:00 AM ET. State Office Satellite Complex at SouthWood, Esplanade Way, Tallahassee, Florida. 2016 story. 2015 story. 2014 story. 2013 story. 2012 story. 2011 story. 2010 story. 2009 story. Event web site. Event page on Facebook. Entry form and flyer. Online registration at EventBrite.com. David Yon, david@radeylaw.com or 850-425-6671 or 850-668-2236. 5th annual Harvest Run 10K, 5K, and one-mile fun run. 8:30 AM ET 10K and 5K. Leesburg Recreation Building, 110 Starksville Avenue, Leesburg, Georgia 31763. 2017 story. 2016 story. 2015 story. Event profile on Facebook. Race web site. 19th annual Pilgrim Chase Trail Run 5K. 9:00 AM CT. Westgate Park, 801 Recreation Road, Dothan, Alabama 36303. 2017 story. 2016 story. 2015 story. 2014 story. 2013 story. 2011 story. 2010 story. Event web page. Larry Dykes, drcprez@yahoo.com or 334-792-6021. Jingle Bell Run 3K Fun Run. 6:15 PM ET. Downtown Tallahassee, Monroe Street at Park Avenue, Tallahassee, Florida 32301. 2017 story. 2015 story. 2014 story. 2013 story. 2012 story. 2011 story. 2010 story. 2009 story. Event web page. Jan Bubsey, jan.bubsey@talgov.com talgov.com or 850-891-3860. Team RWB New Year's Eve Ultramarathon (24 hour, 12 hour, and 6 hour runs). 8:00 AM ET 24 Hour / 8:00 AM ET and 8:00 PM ET 12 Hour / 8:00 AM and 2:00 PM and 8:00 PM and 2:00 AM 6 Hour. Smith Gym, Fort Benning, Georgia. 2018 event page on Facebook. Online registration at UltraSignUp.com. 8th annual Valdosta BCM Run For Missions 4 Mile. 8:00 AM ET. Baptist Collegiate Ministries House, 1522 North Oak Street, Valdosta, Georgia 31602. 2018 story. 2017 story. 2016 story. 2015 story. 2014 story. 2013 story. USATF certified four-mile course #GA18031WC. Entry form and flyer. Online registration at RunSignUp.com. USATF Cross-Country Championships. 8:00 AM ET Community 5K / 9:00 AM ET Masters Women 6K / 9:45 AM ET Masters Men 8K / 10:45 AM ET Junior Women 6K / 11:20 AM ET Junior Men 8K / 12:05 PM ET Senior Women 10K / 12:55 PM ET Senior Men 10K. Apalachee Regional Park Trail, 7550 Apalachee Parkway, Tallahassee, Florida. Event page on Facebook. 7th annual Jog With The Generals 10K, 5K, and one-mile fun run. 8:00 AM ET 10K & 5K / 9:30 AM ET one mile. Georgia Christian School, 4359 Dasher Road, Valdosta, Georgia. 2018 story. 2017 story. 2016 story. 2015 story. 2014 story. 2013 story. Event profile on Facebook. Event web page. Online registration at RunSignUp.com. 26th annual Run For The Cookies 5K and one-mile fun run. 8:30 AM ET one mile / 9:00 AM ET 5K. Tallahassee Community College Lifetime Sports Center, 444 Appleyard Drive, Tallahassee, Florida 32304. 2018 story. 2017 story. 2016 story. 2015 story. 2014 story. 2013 story. 2011 story. 2010 story. USATF certified 5K course FL14006EBM. Dr. Jeanne O'Kon, okonj@tcc.fl.edu or 850-894-2019. 9th annual Chattahoochee Smoochee 5K and one-mile fun run. 10:00 AM ET. Chattahoochee Landing, 269 River Landing Road, Chattahoochee, Florida. 2011 story. 2019 event page on Facebook. Entry form and flyer. info@chattahoocheemainstreet.org or 850-663-23223. 7th annual Break-A-Leg 5K and one-mile fun run. 8:00 AM ET one mile / 8:30 AM ET 5K. Young Actors Theatre, 609 Glenview Drive, Tallahassee, Florida 32303. 2018 story. 2016 story. 2015 story. 2014 story. 2013 story. USATF certified course FL14019EBM. Event web page. Event page on Facebook. Online registration at EventBrite.com. 7th annual Trailblazer 5K and one-mile fun run. 8:30 AM ET 5K / 9:30 AM ET one mile. DeSoto Trail Elementary School, 5200 Tredington Park Drive Tallahassee, Florida 32309. 2018 story. 2017 story. 2016 story. 2015 story. 2014 story. 2013 story. USATF certified course FL14085EBM. Entry form and flyer. Online registration at EventBrite.com. 8th annual Strides For Scholars 5K and one-mile fun run. 8:00 AM CT. Nelson Building, 1311 Balboa Avenue, Panama City, Florida 32401. 2018 story. 2017 story. 2016 story. 2015 story. Event web page. 2019 event page on Facebook. Entry form and flyer. Online registration at active.com. 22nd annual Sweetheart Run 5K and one-mile fun run. 9:00 AM ET 5K / 10:00 AM ET one mile. Rehabilitation Services of Tifton, 1488 Old Ocilla Road, Tifton, Georgia. 2016 story. 2015 story. 2011 story. Event web page. Entry form and flyer. Online registration at active.com. Sommer Dunston, rst.sdunston@yahoo.com or 229-386-5200. FSU Medical Response Unit's 10th annual Run For Your Life 5K. 9:00 AM ET. Integration Statue on Woodward Plaza, Florida State University, Tallahassee, Florida. 2018 story. 2017 story. 2016 story. 2015 story. 2014 story. 2012 story. 2011 story. 2010 story. 2019 event page on Facebook. Online registration at RunSignUp.com. 31st annual Shamrock Scurry 5K and one-mile fun run. 8:00 AM ET one mile / 8:30AM ET 5K.Killearn United Methodist Church, 2800 Shamrock South, Tallahassee, Florida 32309. 2018 story. 2017 story. 2016 story. 2015 story. 2014 story. 2013 story. 2012 story. 2011 story. 2010 story. USATF certified course #FL10021EBM. Event web page. Event profile on Facebook. 2019 event page on Facebook. Online registration at EventBrite.com. 13th annual Albany Marathon and Half-Marathon. 7:00 AM ET. Veteran's Park, 112 North Front Street, Albany, GA 31701. 2018 story. 2017 story. 2016 story. 2015 story. 2014 story. 2013 story. 2011 story. 1912 story. USATF certified course GA10101WC (Marathon), GA10100WC (half-Marathon). Event web site. Entry form and flyer. Online registration at active.com. info@albanymarathon.com or 229-317-4760. 10th annual Race The Tortoise 5K. 8:00 AM ET. O'Leno State Park, 410 S.E. O'Leno Park Road, High Springs, Florida 32643. 2018 story. 2016 story. 2015 story. 2014 story. USATF certified course FL09011EBM. Event page on Facebook. Event web page. Entry form and flyer. Online registration at ItsYourRace.com. 386-454-0723. 19th annual Mardi Gras 5K and one-mile fun run. 8:00 AM CT 5K / 9:30 AM CT one mile. Frank Brown Park, 16200 Panama City Beach Parkway, Panama City Beach, Florida 32413. 2018 story. 2017 story. 2016 story. 2014 story. 2011 story. Event page on Facebook. Online registration at active.com. Entry form and flyer. Joe Edgecombe, joeruns@yahoo.com or 850-763-5005. 19th annual Smoothie King 5K and one-mile fun run. 8:00 AM ET. Valdosta State University Recreation Center, 1300 Sustella Avenue, Valdosta, Georgia 31698. 2018 story. 2017 story. 2016 story. 2015 story. 2014 story. 2011 story. 41st annual Winston Howell 5K Road Race. 9:00 AM CT. National Guard Armory, Highway 52 and 167, Hartford, Alabama 36344. 2016 story. 2015 story. 2014 story. 2013 story. 2011 story. Event web site. Entry form and flyer. 42nd annual Gate River Run 15K. 8:00 AM ET. EverBank Field, 1 EverBank Field Drive, Jacksonville, Florida 32202. Event web site. 2018 story. 2011 story. 2010 story. McGuire's 42nd annual St. Patrick's Day Prediction 5K. 9:00 AM CT. McGuire’s Irish Pub, 600 East Gregory Street, Pensacola, Florida 32502. 2018 story. USATF certified 5K course FL14026EBM. Online registration at RunSignUp.com. 10th annual Don't Run With Scissors 5K and one-mile fun run. 8:00 AM ET 5K / 9:00 AM ET one mile. Sallas Mahone Elementary School, 3686 Lake Laurie Drive, Valdosta, Georgia 31605. 2017 story. 2016 story. 2015 story. 2013 story. 2011 story. Event profile on Facebook. 42nd annual Okefenokee 10K Swamp Run. 9:00 AM ET. Georgia Lions Camp for the Blind, 5626 Laura Walker Road, Waycross, Georgia 31503. 2017 story. 2016 story. Event page on Facebook. Entry form and flyer. Online registration at RunSignUp.com. Heather Hall, okefenokeetcc@gmail.com or 912-816-7668. 9th annual Trail of Payne 10K. 8:30 AM ET. Payne's Prairie State Park, 100 Savannah Boulevard, Micanopy, Florida 32667. 2018 story. 2017 story. 2016 story. Event web page. Event profile on Facebook. Entry form and flyer. Online registration at RunSignUp.com. 9th annual Shamrock Jog and Jam 5K Night Race and one-mile fun run. 6:00 PM ET one mile / 6:30 PM ET 5K. Rylander Park, 110 North Hampton Street, Americus, Georgia. 2017 story. 2016 story. 2015 story. Event profile on Facebook. Online registration at active.com. 11th annual Peanut Proud 5K and one-mile fun run. 8:00 AM ET. College Street at Court Square, Blakely, Georgia. Event web site. Gulf Winds Track Club's 44th annual Springtime 10K, 5K and one-mile kids' run. 7:45 AM ET one-mile / 8:00 AM ET 10K and 5K. Leon County Courthouse, 301 S Monroe St, Tallahassee, Florida 32301. 2018 story. 2017 story. 2016 story. 2015 story. 2014 story. 2013 story. 2012 story. 2011 story. 2010 story. 2009 story. USATF-certifed course FL12022EBM (10K). USATF-certifed course FL11045EBM (5K). Event web site. Online registration at EventBrite.com. springtime10k@gmail.com. 13th annual Leadership Gainesville Alumni Association 5K Cross-Country Race. 6:00 PM ET. Ironwood Golf Course, 2100 NE 39th Avenue, Gainesville, Florida 32601. 2018 story. 2017 story. Event web page. 2018 event page on Facebook. Online registration at RunSignUp.com. 12th annual Draggin’ Tail Ultra Trail Challenge 25K / 50K. 7:00 AM ET. Torreya State Park, 2576 NW Torreya Park Road, Bristol, FL 32321. 2018 story. 2017 story. 2016 story. 2015 story. Event page on Facebook. Entry form and flyer. Joe Edgecombe, joeruns@yahoo.com or 850-774-0018 or 850-265-8439. Gulf Winds Track Club's 45th annual Palace Saloon 5K. 8:00 AM ET. James Messer Fields Park, Jackson Bluff Road and Dupree Street, Tallahassee, FL 32304. USATF certified course FL13028EBM. 2018 story. 2017 story. 2016 story. 2015 story. 2014 story. 2013 story. 2012 story. 2011 story. 2010 story. 2009 story. Event web site. Event page on Facebook. Online registration at EventBrite.com. Worm Gruntin' 5K. 8:30 AM ET. Sopchoppy, Florida. 2018 story. 2017 story. 2016 story. 2015 story. Event web page. Entry form and flyer. Susan Brooks Shearer, smbshearer@aol.com or 850-545-6678. 6th annual Coach Post 10K, 5K, and one-mile fun run. 7:00 AM CT 10K / 7:15 AM CT 5K / 8:15 AM CT one mile. St. Andrews State Park, 4607 State Park Lane, Panama City, Florida 32408. 2018 story. 2017 story. 2016 story. 2015 story. Event web page. Event profile on Facebook. Online registration at active.com. Sentinel Sprint 5K and one-mile fun run (Formerly the Colin P. Kelly 5K). 8:00 AM ET 5K / 9:00 AM ET one mile. Colin P. Kelly Fitness Center, Building 12, 325 NW Turner Davis Drive, North Florida Community College, Madison, Florida 32340. 2018 story. 2017 story. 2016 story. Event web page. Entry form and flyer. Tyler Coody coodyt@nfcc.edu or 850-973-1639. 42nd annual Rose City Run 10K and one-mile kids' run. 8:00 AM ET 10K / 9:30 AM ET one mile. North Broad Street and Monroe Street, Thomasville, Georgia 31792. USATF certified course GA12003WC (10K). 2018 story. 2017 story. 2016 story. 2015 story. 2014 story. 2013 story. 2012 story. 2011 story. 2010 story. Event web page. 2019 event page on Facebook. Entry form and flyer. Online registration at active.com. rcr@ymcathomasville.org or 229-226-9878. 6th annual Nene Fest 5K and one-mile fun run. 8:00 AM ET 5K / 9:00 AM ET one mile. Optimist Park, East Indianhead Drive, Tallahassee, Florida. 2018 story. 2017 story. 2015 story. 2014 story. USATF certified course FL06045DL. Event profile on Facebook. 2019 event page on Facebook. Entry form and flyer. Online registration at EventBrite.com. 4th annual Tate's Hell And Back 5K. 8:00 AM ET. Carrabelle Christian Center, 142 River Road, Carrabelle, Florida 32322. 2018 story. 2017 story. 2016 story. Event page on Facebook. Entry form and flyer. BeLinda Wharton, bhwharton@gmail.com or 850-544-5410. 18th annual Tallahassee Tails and Trails Half Marathon, 10K, 5K, and one-mile fun run. 8:30 AM ET. Tallahassee-Leon County Animal Service Center, 1125 Easterwood Drive, Tallahassee, Florida 32311. 2018 story. 2017 story. 2016 story. 2015 story. 2014 story. 2013 story. 2012 story. 2011 story. 2010 story. 2009 story. Event web site. 34th annual Race Judicata 5K and one-mile fun run. 8:00 AM CT 5K / 9:00 AM CT one mile. Bay County Courthouse, 300 East 4th Street, Panama City, Florida 32401. 2018 story. 2017 story. 2011 story. Event page on Facebook. Online registration at active.com. 32nd annual Gnat Days 5K. 7:00 PM ET. Courthouse Square, Camilla, Georgia. 2018 story. 2017 story. 2016 story. 2015 story. 2014 story. 2013 story. 2012 story. 2011 story. Jennifer Burnum, jennifer@camillageorgia.com or 229-336-5255. Marzuq Shrine's 16th annual Mothers Day 5K and one-mile fun run. 8:00 AM ET one mile / 8:30 AM ET 5K. Maclay Gardens State Park, 3540 Thomasville Road, Tallahassee, Florida 32309. 2018 story. 2017 story. 2016 story. 2015 story. 2014 story. 2013 story. 2012 story. 2011 story. 2010 story. 5K course map. Event profile at Facebook. 8th annual BFD Catfish Crawl 5K and one-mile fun run. 8:00 AM CT. M and B Train Park, North Main Street and Railroad Avenue, Blountstown, Florida 32424. 2017 story. 2016 story. 2015 story. 2014 story. 2013 story. 2012 story. USATF certified course FL16045EBM (5K). Event web page. Event profile on Facebook. Ben Hall, firechief@blountstownfire.org or 850-674-4988. Gulf Winds Track Club's 22nd annual Potluck Bash Four-Mile Cross-Country Race. 6:00 PM ET. Forestmeadows Athletic Center, 4750 North Meridian Road, Tallahassee, Florida. 2018 story. 2017 story. 2016 story. 2015 story. 2014 story. 2013 story. 2012 story. 2011 story. 2010 story. 2009 story. Event page on Facebook. Online registration at EventBrite.com. David Yon, david@radeylaw.com or 850-425-6671. 8th annual 5K At Fifth. 8:00 AM ET. Paisley Café, 1123 Thomasville Road, Tallahassee, Florida. 2017 story. 2016 story. 2015 story. 2014 story. 2013 story. Event web site. Event page on Facebook. 3rd annual "Props to You, Dad!" Father's Day 5K. 6:30 PM CT. Props Brewery and Tap Room, 125 Lovejoy Road NW, Fort Walton Beach, Florida 32548. 2017 story. Event web page. Event page on Facebook. Online registration at active.com. 41st annual Hot Trot 5K. 7:30 AM CT. Washington-Holmes Technical Center, 757 Hoyt Street, Chipley, Florida 32428. 2016 story. 2015 story. 2014 story. 2013 story. 2012 story. 2011 story. Course map. Entry form and flyer. Stan Owens 850-547-2244. Wakulla County Cross Country Boosters' 7th annual Paul Hoover Freedom 5K and one-mile fun run. 8:00 AM ET 5K / 8:45 AM ET one mile. Wakulla Springs State Park, 550 Wakulla Park Drive, Wakulla Springs, Florida 32327. 2018 story. 2017 story. 2016 story. 2015 story. 2014 story. 2013 story. Event page on Facebook. Entry form and flyer. Online registration at EventBrite.com.